In one of the final rooms of the Royal Academy’s blockbuster exhibition of new work by David Hockney that closed earlier this week there was a video wall showing a series of short films that take Hockney’s 1970s and ’80s photo montages into the digital video age. Using arrays of 9 and 18 video cameras mounted to film a single scene simultaneously, Hockney was looking once again to break free from the single point of view and prescriptive framing that defines photography and film. In his photo montage and film works – as with his painting – Hockney is aiming to achieve a more immersive representation of reality and experience: A Bigger Picture, as the exhibition was titled. One of the film pieces depicts a slow passage along a country lane. In the opening moments we see a pair of cyclists ride towards the camera array, and past it, behind us. Apart from two film pieces filmed in his studio and featuring Hockney, several of his friends and small corps of ballet dancers, this pair of cyclists on the country lane are the only people depicted in the entire exhibition. We must assume that there is an element of intention here for Hockney’s sometimes flamboyant persona belies a hard grafting master of technique and detail. For me, it seems entirely appropriate as the whole of A Bigger Picture spoke to my experiences as a cyclist – as a cyclotouriste – in ways that I found joyful and uplifting. In the same conversation with Andrew Marr, Hockney talks of moving to the East Yorkshire Wolds having lived for three decades in southern California. It was a homecoming for this is where Hockney grew up and where he had spent thirty Christmases, back from Los Angeles to visit his mother who lived in Bridlington, on Yorkshire’s North Sea coast. Hockney recalls his life as a teenager cycling to and from work along the lanes that have been the subject of his most recent work and are the main subject of A Bigger Picture. He’s no longer riding a bike, but I think he is recalling how the particular sensual, rhythmic experience of travelling in a landscape by bicycle – the kinaesthetic qualities of bicycle travel – contributes to the cyclotouriste’s appreciation of the character and meaning of particular places. Cycling is a functional mode of everyday transportation but it is also a pastime. Driving a car for pleasure (‘motoring’) was once a common pastime but is increasingly rare. People drive with a purpose or destination in mind. Hockney’s own reacquaintance with the East Yorkshire landscape was through a period of daily car journeys to visit a terminally ill friend. Any enjoyment of the journey is largely incidental to getting from here to there. It’s not hard to see why. Drivers are confined behind the wheel, encased in a small metal box, removed from the elements. Their view is framed and constrained by the windscreen and anyway modern cars travel at speeds that allow only the most fleeting appreciation of the surroundings. It is by walking (and perhaps swimming) that we achieve the most intimate connection with nature and of place, yet when walking or swimming it is difficult to cover much distance or to experience the changing shape and character of the landscape, to experience it as it unfolds around us. The bicycle is perfect for plugging into the Bigger Picture. A cheap, light, noiseless machine that affords total immersion in our surroundings and enables us to cover relatively large distances with minimal effort. The chief drawback compared to walking is that the cyclist is more confined to roads and byways, whereas the walker has the most freedom to roam at will (especially if prepared to trespass). 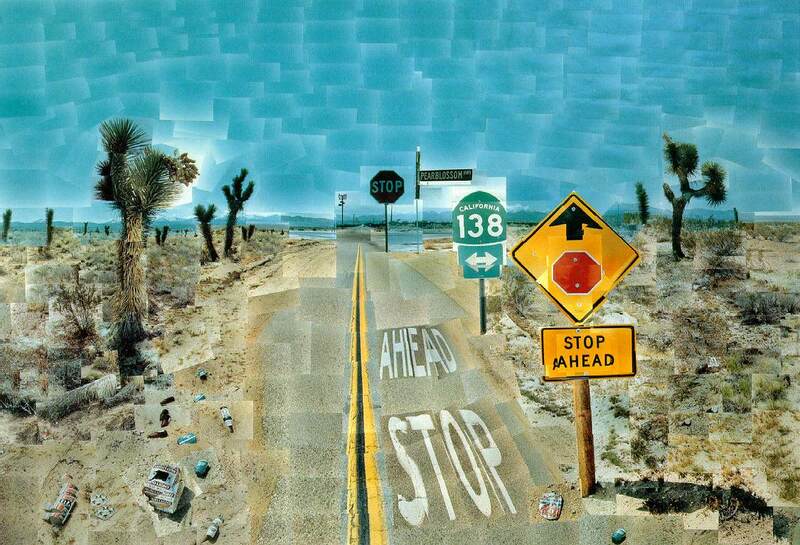 The road is a familiar Hockney motif and it is a near constant in these paintings. Roads that twist and turn in extravagant loops, roads that roll cheerfully across the landscape, dipping behind hills and returning to crest the next ridge. Roads that travel through woods, arched over by trees that form arboreal tunnels in which light and dark stripe the tarmac surface. These are roads with personality, even down to their surface which is carefully observed and rendered. In the small number paintings where the road is unseen it is clear that the landscape is being viewed from the road, looking out across a hedgerow or or verge rich with foliage and star-spangled with cow parsley. These are roads where you are unlikely to see many cars. Roads along which cyclists like to ride. Hockney’s Tunnel series presents the same view of a single green lane lined by trees on each side at different times of year. With its thick grass mohican running down the centre it’s easy to picture a lane like this on any countryside ride. Like Hockney, the cyclist returns to the same lanes, noticing the changes in the season, the weather, the time of day, variations in light and vegetation. After some years the cyclist would really know that lane very well. It is exciting to adventure into a new places, and ride along untravelled roads, but what cyclists most often find themselves doing is returning to the same places, the same roads, over again. New places can be thrilling, but familiarly can bring with it a deeper understanding and affection for a place. After three decades abroad, Hockney has returned to the countryside of his youth, bringing with him the dramatic light and shade and sublime, super saturated pigments of the American West. Along with his gift for composition he puts this luxurious palette to work in rendering the English countryside in a bold new light that is unexpected yet I think utterly faithful to the lived experience of total immersion in the landscape. The colours, shapes and textures of the English countryside are as exciting as those in southern California or anywhere else in the world. Vast, constantly changing skies, clumps of acid green euphorbia, deep red beech forests, an iridescent woodland carpet of bluebells, banks of hot pink willowherb and perhaps most spectacular of all, the hawthorn blossom that erupts between the coming of spring and the early summer. Hockey dubs this ‘Action Week’, a reference not just to the growth in the hedgerows but to his own relish at being out there and painting them. This time of year is startling to behold and Hockney brings passion and excitement to his canvasses, to the point of putting off many of the critics. No doubt, it is an escapist, optimistic, romantic vision of the countryside. But I think it is quite honest and no more sentimental than he means it to be. Hockney pastoral. There are no off-motorway distribution centres, fly-tipped rubbish, wind turbines, ‘luxury home’ developments or industrial farming paraphernalia. He is not drawn to the hallmarks of the Edgelands or the Unofficial Countryside beloved of contemporary psycho-geographers. There’s nothing wrong with Iain Sinclair stalking around the semi-derelict industrial estates of the periurban fringe and taking pleasure in their toxic trades, but that’s not what Hockney’s work is about. It’s about experiencing the relentless forces of nature, observing the shapes and colours of the vistas and plant forms and embracing the simple joys of being out there in the wind and the sun and the snow and the rain, the owls and the bats and the blossom and the bees, the trees and the leaves and the fields and the streams. All of which still exists in every corner of this island, no matter what anyone says about concreting over the countryside. It makes me want to get on my bike and ride. All images are copyright David Hockney (except where otherwise noted) and reproduced for purposes of criticism or review in accordance with Section 30 (1) of the Copyright, Designs and Patents Act 1988.